The 3-year-old tabby was dropped off in a pet carrier in front of an animal clinic more than an hour before she was found. Nicole Paling had no idea she'd be saving two cats last Tuesday night. The founder of Every Life Matters Cat Rescue in Burlington, Ontario, Canada, was driving to Mountainside Animal Clinic after one of the cats she takes care of, Bacci, went into respiratory distress. Though the clinic had already closed at 6 p.m., Paling had after-hours access that would allow her to administer oxygen to Bacci there. As she pulled into the driveway of the clinic around 8:30 p.m., Paling caught sight of a black pet carrier on the curb. Walking closer to get a better look, she soon realized Bacci wasn't the only cat that needed her help that night. "I ran over to the carrier, and I see all this duct tape," Paling said. "I went into an instant panic attack." 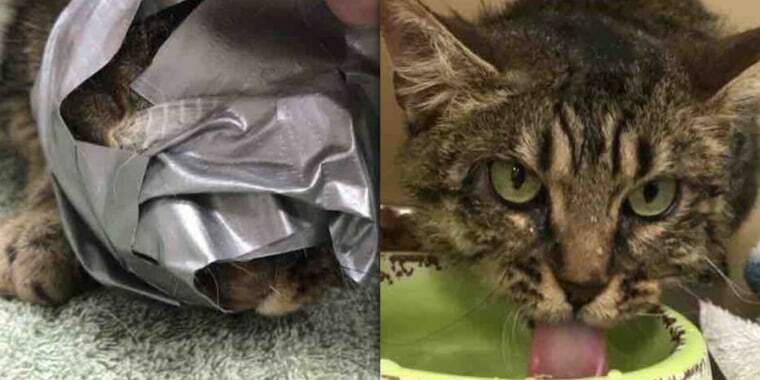 Blinded by the duct tape that ensnared her head was a 3-year-old tabby, whom Paling later named Lucky. "Her face was so tightly wound; it was at least three times around," Paling said. "Her ears were folded in over on top of her head, not down by the side." Paling immediately called her boyfriend, Brett Norton, who was less than two blocks away, to help her free Lucky. "The tape was holding her mouth shut, so all she had was her nose to breathe through," Norton said. "I was trimming a little bit of the tape (with a pocket knife). I tried to cut it and rip, but it stuck to all the hair. I was trying not to cut the ears; I was trying not to hurt the animal in any way." It seems as though Lucky sensed that Paling and Norton were there to help her. "When I got the one side clear, I had to reach in front of her mouth to pull the tape down, and I was fully expecting to get bit at that time," Norton said. "But she didn’t have any aggression whatsoever. She didn’t try to claw or try to do anything like that." Besides having what Paling described as drywall or plaster particles in her fur, Lucky appeared very dehydrated once Paling and Norton had freed her and brought her into the clinic. "She just drank like no tomorrow, like she’d never seen water before," Norton said. "Who knows how long her owner had kept this animal contained and what happened to her in a previous time period?" Paling later obtained video footage that showed an unidentified person drive by and abandon Lucky at 7:25 p.m. on Tuesday. Local police are currently investigating. Paling said Lucky has a few chipped canines and a bladder infection, but is otherwise doing fine — and has had no trouble bringing joy to those around her. "Despite the cruelty she’s been through, she’s one of the most loving cats I’ve ever had the pleasure of working with," Paling said. Lucky has even caught the attention of more than 100 people who have expressed interest in adopting her. "Some person has lost a wonderful animal, and someone else will get to have it — that's the positive takeaway from this," Norton said. "They weren't able to break her spirit."